Wednesday February 14th 1894 I was busy about the house all forenoon. Mrs Main was in. I went to the church in the afternoon. I changed my dress to go over the river. called at Chalfants on my way over. Hattie had Dr. Barretts folks to supper. Will came over before supper. We spent a pleasant evening. Home at nine oclock. Thursday February 15th 1894 Will was gone to the valley all day. I worked up stairs cleaning the rooms Mrs Bivens had and getting things out of the garret ready to move. Mrs Spurleder & Mrs Webb Smith called in the afternoon. I was very tired and went to bed early. 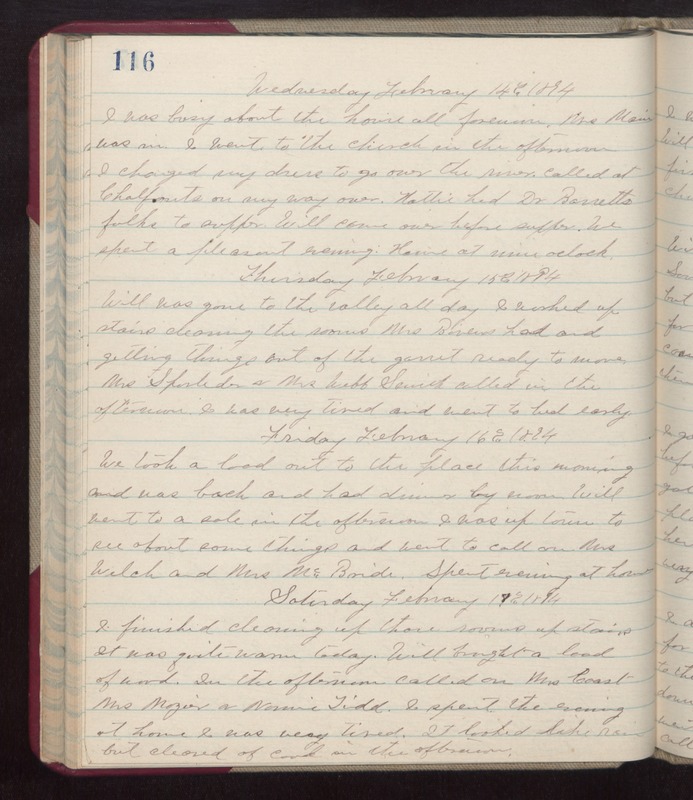 Friday February 16th 1894 We took a load out to the place this morning and was back and had dinner by noon. Will went to a sale in the afternoon. I was up town to see about some things and went to call on Mrs Welch and Mrs McBride. Spent evening at home. Saturday February 17th 1894 I finished cleaning up those rooms up stairs. It was quite warm today. Will brought a load of wood. In the afternoon called on Mrs Coast, Mrs Major & Norine Tidd. I spent the evening at home. I was very tired. It looked like rain but cleared of [cold?] in the afternoon.